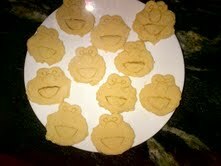 Allergy-Free (Elmo) Sugar Cookies — Update — New Recipe!!! Looking for a good snowy or rainy day activity with your food-allergic toddler?! I have found a new, better vegan sugar cookie recipe, on this other blog. It is so much better than the other recipe that I was using. I used Earth’s Balance vegan butter sticks for the butter. And one note — after having made the dough several hours before using it, and refrigerating it in the meantime, I needed to add a lot of flour — probably at least a 1/4 to 1/2 a cup — so that the dough wasn’t too sticky. I ended up just adding flour until it reached the right consistency to be rolled out and cut into shapes by little fingers! For toppings, I used mini- allergy-free chocolate chips, raisins, and a sugar and cinammon mixture. I baked the cookies for 9 minutes, and that seemed to do the trick! These cookies were truly delicious. Use some fun cookie cutters if you can. I bought the Sesame Street ones from Williams-Sonoma. But if you don’t have any on hand, you can always use the top of a water or other glass to make circles, and then get a bit more creative with your toppings (fresh shredded coconut, raisins, sugar, etc.). And I dare you not to eat all the cookies while your children are asleep!